Inflate: Hold the front risers, arms relaxed. Step forward until the lines become just tense without moving the canopy. Make sure both arms feel the same even tension by stepping to either side. This ensures you are in the center of the canopy and facing into the wind. Look ahead fix a point in the distance directly into the wind keep looking at this as you inflate the wing. Step smoothly forward, the amount of energy you give the glider will change depending on the wind strength and the steepness of the terrain. Smoothly inflate the canopy with the minimum energy required this will prevent the glider overshooting. The pull must come from the carabiners on the harness not from your arms. Control: Once overhead the risers will tug upwards this is the point to let go of the front risers and pull on the necessary amount of brake to control the glider and prevent it overflying. Until the glider is above and t risers released the pilot can not perform any correction with brake controls. For this reason it is mandatory to follow the glider, even if the flight direction should not be completely respected. If this is not feasible because the launching site is too small, the flight must be suspended. If the glider pulls to one side then side step diagonally forward to center yourself under the canopy. Look ahead to a fixed point will help you to do this. Do not look over your shoulder as you pull the glider up as it will pull unevenly to one side. Check and control the canopy: Pull deeply with the brakes then release a little. 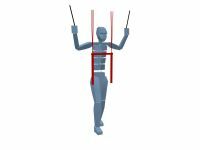 Hold the glider above your head with the brakes and maintain pressure on the waist strap by leaning forward. Check the wing is fully inflated, the lines are untangled, no cravattes (a line over the wing tip) take your time and stabilise the wing so you are centralised and have good pitch and roll control. Decide: You must have a prearranged decision line on the take off - this is the point to abort if you are in any doubt that the launch will be successful. STOP if you need to abort then stop running, fully brake one or both sides depending on the steepness of the slope. A wrap may be required depending on the length of the brakes. Step backwards to take the tension off the lines. Accelerate: Lengthen your stride and accelerate progressively. Maintain the contact with the glider whilst allowing it to gain its speed. Keep running into the Sky. Clear Terrain: Maintain contact with the brakes as you glide clear away from the hill with your legs down prepared to run, keep one leg stretched forward and one leg tucked underneath. Once well clear of the terrain keep your head forward and lift your knees and smoothly sit in your harness whilst keeping contact with the glider. Blocked brakes cause, most of the time, the abortion of an uncontrolled take-off and dangerous flight situations. That’s why, when checking the 5 points, one must absolutely control whether the brake lines are free from the rear risers handle and pass through the eyelets and from there till the trailing edge without being blocked. The wing rises more or less rapidly depending on the type of wing and wind conditions. 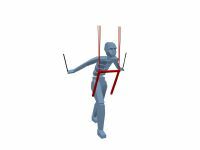 Slow wings (only hold the front risers both sides) usually require a stronger impetus than fast wings (hold on both sides the front risers of the first and second row). Cause: The canopy is spread in a poorly laid out or the central cells did not open. Next time pull the brake controls down more to either side when laying out the glider to create a nice arc into wind. Correction: Pull the brake control briefly and vigorously and release them immediately, then hold again the front risers and continue inflating. Cause: Not facing into wind, uneven tension on the hands. 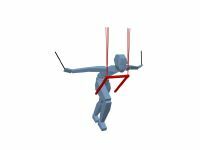 Correction: Look into wind and step forward keeping even tension side step forward to move under glider. Cause: Pulling your hands forward on the risers or launching too vigorously. 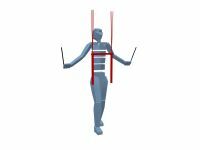 Correction: Pull with the harness no tension in your arms.